I’ve already told you about the famous Wooly Pigs — prized for fat so luscious it’s known to cause those who’ve tasted it to burst out in song. Wanna taste some? Check this out: sibling-chef team Eric and Sophie Banh along with Monsoon’s Johnny Zhu, and Food & Wine’s 2009 “Best New Chef” Mark Fuller of West Seattle’s Spring Hill are hosting the first of a series of monthly themed dinners. Those multi-course meals commence at Monsoon East on Capitol Hill May 27. The theme for their kickoff event? 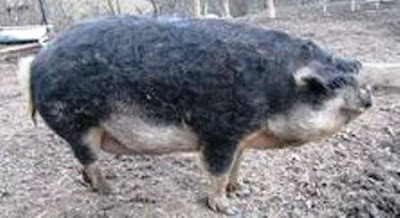 Mangalitsa pig. Parker House rolls with whipped Mangalitsa fat (“treyf schmaltz” where I come from). English pea icebox salad with grilled Mangalitsa shoulder, garlic chips and bell pepper gel (talk about a chip on your shoulder). Crispy Mangalitsa belly with bean sprouts, charred fava beans, lotus stems and pork jus (pork jus? Mom! They’re calling me names again!). Torchon of Mangalitsa head with Jasmine congee, double consomme, pickled vegetables and wood sorrel (head cheese with jook? bet you can’t get that at Jade Garden). Crispy pork jowl with egg-yolk raviolo, Parmesan and sage (now, that’s Italian). Strawberry “tart” with liquid Mangalitsa sable (the cookie, not the smoked-fish staple — and hey, will someone tell me how to key-in an accent aigu in Moveable Type? ), local strawberries, yuzu curd and lemon verbena. Interested? They’ll be two seatings (6 and 8:30 p.m.). Reserve by calling Monsoon: 206-325-2111.